With the development of smartphones, daily new devices and features are offered to us. These new and improved devices can sometimes be quite hard for using, especially if we don't understand the devices completely. Learning the details about the device can help us understand the device and use it on the proper way. There is a productivity app that offers you hardware information about your phone, learning you everything you need to know about your device – Device Info Plus. What is Device Info Plus? Developed for android users, this highly useful app is a productivity tool that is offering its users to learn more about their android device, fast and simple. On the app, users are offered complete and accurate information about their smartphone. The app is quite easy to use, and users without much effort can get details about the hardware of their phone, the rooting on their phone, learning about the brand and manufacturer of their device. Using this highly effortless app, users can get all the info about their phone, learning to use their android properly. 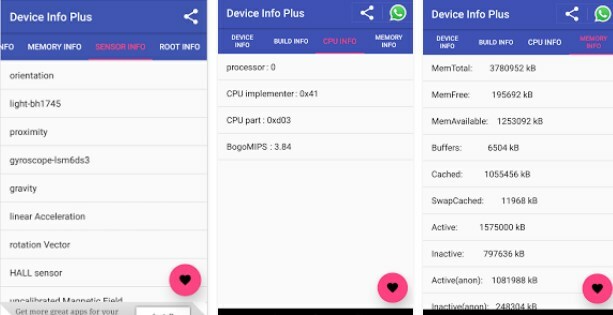 This effortless info checking tool, is offering its users to help them get without issues complete information about their android. The app gives details about the android's hardware, and the information are separated into 2 different categories. The category with device information is offering details about r the Model, Manufacturer, Chipset, Build Number and Android OS version, and the system category is giving info about CPU architecture, Board, Number of Cores, Clock Speed, CPU Features, Governor and Kernel information, as current CPU Utilization, Total running processes, and clock frequency of each core. Also, users can learn about t the brand of the device, the manufacturer of the device, Device Id, IP Address, Mac Address, Fingerprint, CPU1, CPU2, and Board. The share icon is allowing the users to share the app with other people, and also, the app is allowing users to copy certain info with only pressing long on the screen.